The 2014 Loyalty Card is here! The LOVE GENEVA loyalty card — putting your money where your heart is! 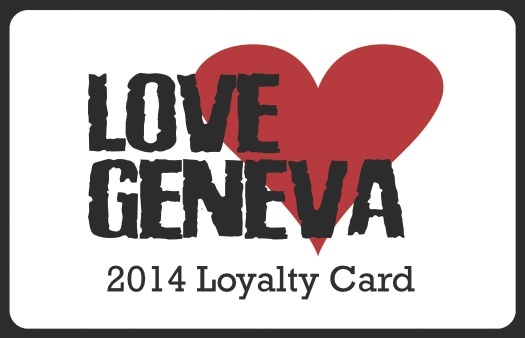 We are proud to announce our newest project: the 2014 LOVE GENEVA loyalty card. Co-sponsored by the UG Collective, the loyalty card provides the cardholder with great rewards from participating local businesses. The LOVE GENEVA loyalty card is available for $10.00 at Finger Lakes Gifts & Lounge, Stomping Grounds, Earthly Possessions, and Burrall Insurance. All profits from the sale of the card will go to the Foundation for Geneva Public Library, which provides financial support for the Library. A list of participating businesses and their current loyalty rewards is provided under the “2014 Loyalty Card” link on the left. The card can be used at participating Geneva businesses. The holder of the card is entitled to whatever benefits the business establishes as their “loyalty reward.” This could entail things such as a 10% discount, a free dessert with meal, half price on selected items – whatever the business wants to establish. The business may change the “loyalty reward” on a monthly or seasonal basis. Shop Local campaigns across the country have had great success with loyalty cards. Research indicates that shopping local increases when shoppers are incentivized to do so. All profits made from the sale of loyalty cards will be going to the Foundation for Geneva Public Library, which provides financial support for the Library. ARE YOU AN INTERESTED BUSINESS? Our volunteers have tried to contact all the locally-owned businesses in Geneva, but may have missed you. If you are interested in participating, please contact us at LoveGenevaNY@gmail.com. Thanks!